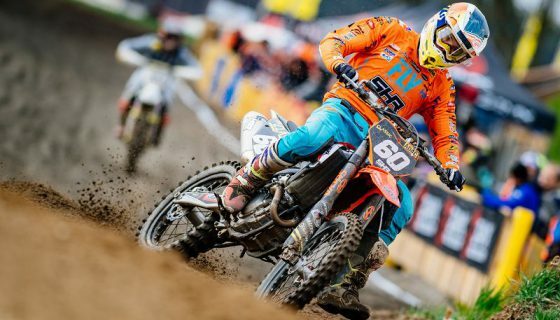 HERLINGS AND JONASS PERFECT IN VALKENSWAARD. The 2018 MXGP of Europe at the famous Eurocircuit in Valkenswaard has finished in epic fashion. The dark Dutch sand was as unforgiving as it was testing for the top MXGP and MX2 riders in the world. While the conditions were vastly different from the season opener in Patagonia Argentina the result was much the same with Red Bull KTM Factory Racing’s Jeffrey Herlings and Pauls Jonass taking the overall wins and maintaining their Red Plates. Red Bull KTM Factory Racing’s Jeffrey Herlings came to Valkenswaard with his first ever red plate in MXGP and left it with his first ever points lead in the premier class. 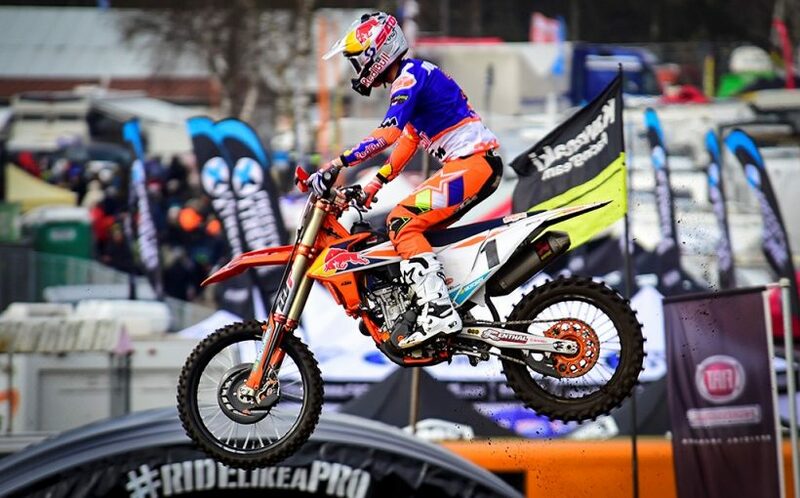 At the start of the weekend Herlings struggled when he fell in qualifying then rejoined the race in 35th position. Luckily for the “Bullet” he turned his weekend around on Sunday. Luckily for the “Bullet” he turned his weekend around on Sunday even with 19th gate pick. 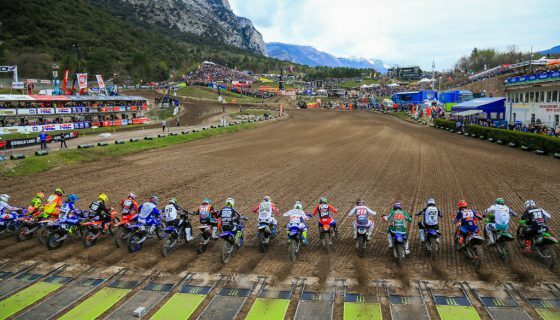 When MXGP race 1 started Red Bull KTM Factory Racing’s Antonio Cairoli took the Fox Holeshot and led the way for Monster Energy Yamaha Factory MXGP’s Jeremy Van Horebeek along with his Dutch Red Bull KTM Factory Racing Teammates Glenn Coldenhoff and Jeffrey Herlings. After a quick pass on Coldenhoff, Herlings switched his focus over to the Belgian, Jeremy Van Horebeek. As Herlings chased Van Horebeek, Team HRC’s Tim Gajser was passed for 5th by the other Monster Energy Yamaha Factory MXGP bike of Romain Febvre. 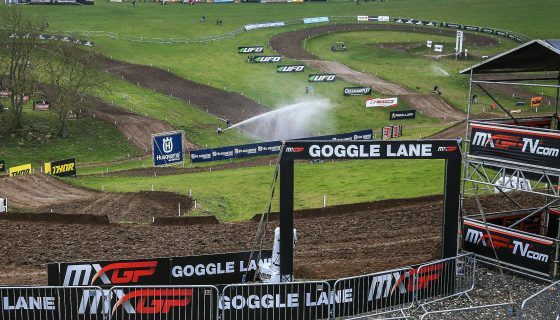 Gajser then threw away his goggles and soon after came under pressure from the pair of Rockstar Energy Husqvarna Factory Racing riders, Max Anstie and Gautier Paulin. Just after Anstie and Paulin made their way past Gajser, Jeffrey Herlings moved into the second spot. Cairoli then started to lose time to Herlings as Anstie and Paulin passed Febvre. As Jeffrey inched closer to Cairoli the Italian lost balance in a rut and went down. From there Herlings took the lead and never looked back as Cairoli took second and Van Horebeek third. Race 2 began with another Fox Holeshot from Red Bull KTM Factory Racing’s Antonio Cairoli as Coldenhoff and Herlings chased. Cairoli then sprinted at the start of the race to grow a gap over Coldenhoff and Herlings. Herlings found his way around Coldenhoff on lap 3 and at nearly the same time race one’s 3rd place finisher, Van Horebeek, crashed out of the race but came away uninjured. Herlings then started his charge to catch the distant Cairoli. Cairoli’s lead was near 13 seconds but dropped lap after lap, at one point Herlings gained 4 seconds in a single lap. As Herlings came closer Cairoli sensed the #84 looking back on several occasions. When the time finally came Herlings made the pass look easy as he out braked Cairoli into the turn just after the finish line. Cairoli tried to retaliate but would cross the checkered flag 3.8 seconds after Herlings. Team HRC’s Tim Gajser’s return to MXGP was a challenging one as he crashed twice in race 2, even so he managed to finish 9th overall. Finishing on the podium was Gautier Paulin who also took third overall after tying with Coldenhoff in points while Febvre scored his 2nd top 5 of the season. MXGP Race 1 Top Ten: 1. Jeffrey Herlings (NED, KTM), 35:25.408; 2. Antonio Cairoli (ITA, KTM), +0:17.536; 3. Jeremy Van Horebeek (BEL, Yamaha), +0:29.712; 4. Max Anstie (GBR, Husqvarna), +0:35.842; 5. Glenn Coldenhoff (NED, KTM), +0:39.777; 6. Romain Febvre (FRA, Yamaha), +0:41.582; 7. Gautier Paulin (FRA, Husqvarna), +0:41.778; 8. Clement Desalle (BEL, Kawasaki), +1:00.045; 9. Tim Gajser (SLO, Honda), +1:07.341; 10. Jeremy Seewer (SUI, Yamaha), +1:15.242. MXGP Race 2 Top Ten: 1. Jeffrey Herlings (NED, KTM), 34:46.875; 2. Antonio Cairoli (ITA, KTM), +0:03.882; 3. Gautier Paulin (FRA, Husqvarna), +1:06.699; 4. Glenn Coldenhoff (NED, KTM), +1:09.303; 5. Romain Febvre (FRA, Yamaha), +1:15.542; 6. Shaun Simpson (GBR, Yamaha), +1:17.843; 7. Clement Desalle (BEL, Kawasaki), +1:46.947; 8. Jeremy Seewer (SUI, Yamaha), +1:54.337; 9. Max Anstie (GBR, Husqvarna), +1:56.307; 10. Kevin Strijbos (BEL, KTM), +1:57.072. MXGP Overall Top Ten: 1. Jeffrey Herlings (NED, KTM), 50 points; 2. Antonio Cairoli (ITA, KTM), 44 p.; 3. Gautier Paulin (FRA, HUS), 34 p.; 4. Glenn Coldenhoff (NED, KTM), 34 p.; 5. Romain Febvre (FRA, YAM), 31 p.; 6. Max Anstie (GBR, HUS), 30 p.; 7. Clement Desalle (BEL, KAW), 27 p.; 8. Jeremy Seewer (SUI, YAM), 24 p.; 9. Tim Gajser (SLO, HON), 20 p.; 10. Jeremy Van Horebeek (BEL, YAM), 20 p.
MXGP Manufacturers: 1. KTM, 100 points; 2. Yamaha, 72 p.; 3. Husqvarna, 68 p.; 4. Kawasaki, 67 p.; 5. TM, 38 p.; 6. Honda, 35 p.; 7. Suzuki, 19 p.
Red Bull KTM Factory Racing’s Pauls Jonass is showing everyone exactly why he was MX2 World Champion in 2017. Jonass admitted that he wasn’t riding or feeling his best but nevertheless the #1 took double race wins today. Race 1 started with the Red Bull KTM Factory Racing bikes of Pauls Jonass and Jorge Prado at the front with a Fox Holeshot from Jonass. Behind the KTM’s was another Austrian made bike, the Rockstar Energy Husqvarna Factory Racing #19 of Thomas Kjer Olsen. 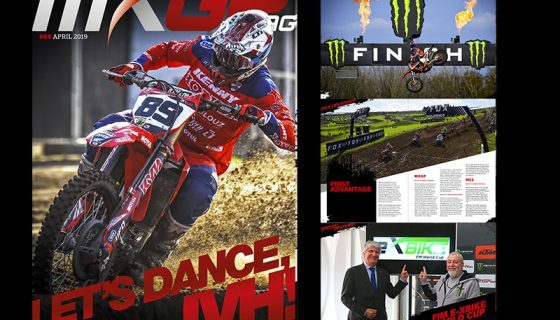 Having a breakthrough performance was Kemea Yamaha Official MX Team’s Jago Geerts. 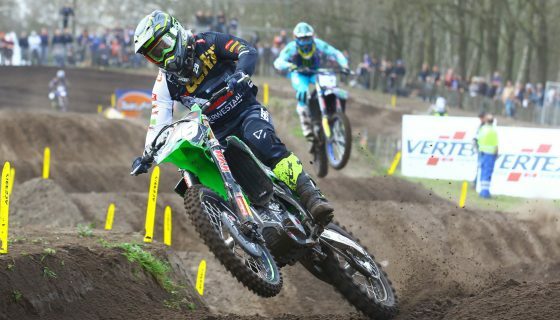 Geerts who race the EMX250 championship last season ran 4th early in the race. 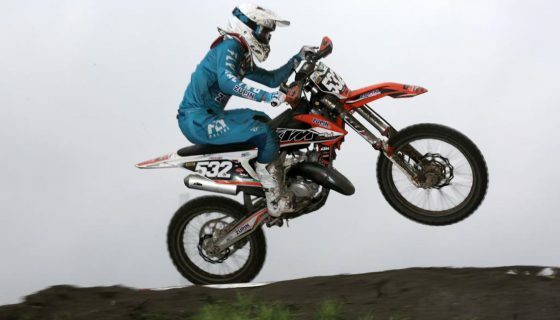 The local MX2 rider from the LRT KTM team, Davy Pootjes was followed by Honda 114 Motorsport’s Hunter Lawrence. Later when Lawrence tried to pass Pootjes on the outside he instead had the door closed and clipped the back of the KTM sending him to the dirt. Pootjes later dropped to 8th while Lawrence got back up to 6th just behind Hitachi KTM UK’s Conrad Mewse. Meanwhile Jonass took the win followed by Prado, Olsen, and Geerts. Race 2 started just as did race one with a FOX Holeshot from Jonass just ahead of Prado and a Husqvarna. However this time the Husqvarna in 3rd belonged to the STC Racing Husqvarna rider Henry Jacobi. Jacobi ran in third for 8 laps before crashing and then pulling of the track. Assuming third was again Olsen as Jorge Prado was doing everything he could to catch his teammate Jonass. Prado would gain time on Jonass one lap and the Jonass would reply with his own gains the next. In 4th and 5th was Conrad Mewse and Rockstar Energy Husqvarna Factory Racing’s Thomas Covington. Covington who won Saturday’s qualifying race finished 7th in race 1. At the finish Jonass crossed the line only 0.38 seconds ahead of Prado while Olsen was another 37 seconds back in third. MX2 Race 1 Top Ten: 1. Pauls Jonass (LAT, KTM), 35:38.265; 2. Jorge Prado (ESP, KTM), +0:09.342; 3. Thomas Kjer Olsen (DEN, Husqvarna), +0:16.508; 4. Jago Geerts (BEL, Yamaha), +0:22.579; 5. Conrad Mewse (GBR, KTM), +0:25.932; 6. Hunter Lawrence (AUS, Honda), +0:42.179; 7. Thomas Covington (USA, Husqvarna), +0:49.290; 8. Jed Beaton (AUS, Kawasaki), +0:53.611; 9. Davy Pootjes (NED, KTM), +0:58.452; 10. Ben Watson (GBR, Yamaha), +1:00.167. MX2 Race 2 Top Ten: 1. Pauls Jonass (LAT, KTM), 35:35.397; 2. Jorge Prado (ESP, KTM), +0:00.381; 3. Thomas Kjer Olsen (DEN, Husqvarna), +0:37.477; 4. Conrad Mewse (GBR, KTM), +0:39.263; 5. Thomas Covington (USA, Husqvarna), +0:46.360; 6. Hunter Lawrence (AUS, Honda), +0:47.057; 7. Ben Watson (GBR, Yamaha), +0:51.600; 8. Adam Sterry (GBR, Kawasaki), +1:05.208; 9. Davy Pootjes (NED, KTM), +1:08.867; 10. Darian Sanayei (USA, Kawasaki), +1:10.665. MX2 Overall Top Ten: 1. Pauls Jonass (LAT, KTM), 50 points; 2. Jorge Prado (ESP, KTM), 44 p.; 3. Thomas Kjer Olsen (DEN, HUS), 40 p.; 4. Conrad Mewse (GBR, KTM), 34 p.; 5. Thomas Covington (USA, HUS), 30 p.; 6. Hunter Lawrence (AUS, HON), 30 p.; 7. Jago Geerts (BEL, YAM), 26 p.; 8. Ben Watson (GBR, YAM), 25 p.; 9. Davy Pootjes (NED, KTM), 24 p.; 10. Adam Sterry (GBR, KAW), 18 p.
MX2 Manufacturers: 1. KTM, 100 points; 2. Husqvarna, 82 p.; 3. Honda, 68 p.; 4. Yamaha, 68 p.; 5. Kawasaki, 60 p.; 6. TM, 11 p.